I've started another crocheted holiday gift (I'll show you the colorful little purse another time, now that it's finished). Now I'm working on a hat for a little one, using the Sly Fox hat pattern from Goodknits. I love this design! It's simple and it crochets up really fast. I have a couple of little guys in mind for this hat, so I may be making more than one. I gave up on my girl Olive this weekend. I wasn't enjoying it. I've never been one to quit a book but I've been giving myself permission to do it every now and then for the past few years. Life is just too short, you know? I used to hang on until the bitter end no matter what, but not so much anymore. I put Olive in the "donate" box and picked up a book I really do love - Silas Marner. I first read it in high school and I reread it every so often. I just bought this new paperback copy a few weeks ago, to replace an old one I'd given away. It's nice to have a copy again, and a fresh, clean one at that. I tend to find myself rereading this book as we approach the holidays, because of the Christmastime setting. I read a lot more Eliot later on, as an English major in college, but this is by far my favorite of her books (and one of my favorite books, period). It's a lovely, touching, human story. Thank you so much for your sweet comments lately. You're such a nice bunch of people and it makes me so happy to know you enjoy my blog and the things I share here. What's new with you? We're getting ready for Halloween and we're all very excited, even the Bear who devised a "mountain man" costume for himself this year. He's been growing out his beard and everything...it's quite a get-up. Finally, it feels truly autumnal here, with real cold at night and lots of rain (this week, anyway), and I'm enjoying my blankets and candles as much as ever - or maybe more, since autumn was a long time coming this year. I hope you're having a good week! Love the colour of the hat, perfect autumn colours :). I love Silas Marner too, I think it is my favourite of hers too. I agree that life is too short to continue reading a book when you don't like it, I have tried a few recently that I have put down a few chapters in. Sometimes I find myself not being able to get into any books at all for a while, luckily it goes eventually! We have illness here so we are hiding under blankets reading stories and sleeping. I keep considering Olive Kitteridge, it's a book I should like, but I keep postponing reading it. I'm afraid I'd be like you and not finish it. I've never read Silas Marner, may give it a try. such a pretty colour!!! very nice!!! Aw, I'm sorry you quit liking Olive. I guess it doesn't compare to Silas Marner (grin). 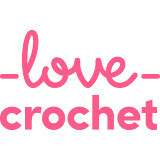 Your crochet looks very nice! Hello,l and warm greetings to you. The day Is realised that I didn't have to finish a book that I wasn't enjoying was truly liberating! Autumn is well and truly here now. The tress are shedding their leaves, and I feel the need to put the heating on at night. And Autumn television always has some cracking thrillers too. Waiting with baited breath for the new series of Luther. Gorgeous rusty red colour. I always love your colour choices Jennifer. I've just dug out my thirty year old Penguin edition of Silas Marner and think I will reread it too. George Eliot is one of my favourite authors and The Mill on the Floss my favourite of her novels. Your hallowe'en preparations sound like fun. I do try and struggle along with books, even when I'm not enjoying them and it's really silly. I wish I could be more like you and put them to one side. Actually, I can remember one which I abandoned, The Girl With The Dragon Tattoo, so unlike me not to finish a book but I couldn't even get started with that one, it definitely wasn't for me. Loving the little hat, they'll make lovely gifts. 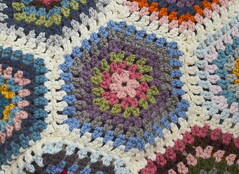 I am swaying towards my crochet at the moment as well , sewing has taken a break for a while. I am making a berry shawl from Moogly Blog which has been on my ravelry wish list for ages - could be my first handmade pressie this year. I love the colour of your hat, so autumnal. Autumn has arrived in full force here too, and I am loving it. The twinkle lights are up, the candles are burning, and the quilts are out. Things are cozy and comfy. Love that hat, such a great colour. We live down the hill from you in the downtown area, so I always enjoy your expressive descriptions of the weather. I too am glad to see that fall is finally here bringing some much-needed rain. We even seasoned our wood stove yesterday. You are not the first to give up on Olive. I was warned off from even trying to read it from friends who usually devour all the award winners. Your hat is lovely. What a great gift! Those hats are so cute! I've seen them floating around Ravelry. 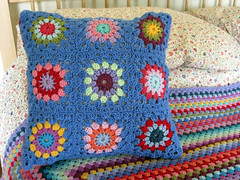 Makes me want to learn to crochet! I'm not surprised you gave up on "Olive" -- like I said last week, we watched the miniseries and I just found her to be so unlikable. I WANTED to like her, but she was just so darn mean and depressing! I've never read any George Eliot, but I'd like to read more classics (one of these days). Cute little hat. Yes, not much cheer around Old Olive, was there? Very Autumnal around here too. The colours are stunning though and the days still bright, for now. They're predicting a tough Winter for us but I refuse to listen. I'll wait unti it happens! Thank you Thistle, you have inspired me to read Silas Marner. I haven't read any Eliot and your description called to me so I've jsut bought it for my Kindle. I have my annual vacation in 2 weeks time and I have added it to my holiday reading. I love your blog, thank you for sharing.. I couldn't agree with you more about Silas Marner. I consider myself lucky that it wasn't required reading during my schooldays as it was during my children's ... not one of them appreciates it as they were made to read it whereas I chose to read it for the first time aged about 16 and like you have returned to it a number of times since. That little hat is going to be so cute! I used to make myself finish books when I started them, but like you I decided my time was more valuable. I think I'll have to look for the Silas Marner book. I've never read it. What an adorable hat! I'm glad it is finally starting to feel like fall where you live, Jennifer. We have all the fall colours out in full force, but it is still unseasonably warm here. I can't wait for it to get cold enough to wear all my hand knits again! And I'm embarrassed to say I've never read Silas Marner. Perhaps I should. I really like the hat. Whatever little head that it covers will be a lucky one for sure. I don't think I've ever read Silas Marner. I think I might have to try to find a copy since you find it interesting enough to read over and over again. We could use some of your rain up here in Washington. We still haven't had hardly any all summer long. Things are so so dry. It's especially noticeable to me today driving back after being in Oregon where everything was so green. The wee hat will be so sweet! I love it when the candles go on in the evenings and it's truly Autumnal. Now I find myself wondering how I've never read Silas Marner... or anything by Eliot. I think it needs to go on the list I never get around to actually making. Lovely color for the hat, and I keep wanting to yell you that your blog is really pretty. I also love the color of that hat. It is going to be perfect. Have not read Silas Marner..will have to do so as soon as I finish the book I am reading right now. I usually finish books, tho. not always. I have an aversion to books that are "the trendy thing to read". Silly behavior on my part, I am sure. I am glad to hear your weather has been just right lately. It's been quite fallish here and I've built a fire in the wood stove every morning for the last week. It makes everything so cozy. Have a lovely weekend..it's almost here. I have bought several of GoodKnits patterns and always enjoy them. Hope your hats turn out like you want them to. Looking forward to seeing the new purse/bag too. Thanks for your candid comments on my last post. ♥ Knowing others have gone through or are going through similar difficult things is comforting somehow. Thank you for sharing with me. Wow! I don't know what a mountain man looks like. I don't think they have them here in England! so be sure to post a picture! I'm anxious to see how the little hats turns out, Jennifer, and that colorful little purse you were working on. I have been doing quite a bit of crocheting. The action has actually kept me from experiencing much neuropathy, which is a common side-effect of the chemo drug I am now getting. I've learned to make some simple little skull caps which are very comfy for sleeping. I'm also working on a fun little wreath project. It's always fun to see what your latest project is! The hat looks lovely, such a beautiful colour for fall. I've recently given up on a book too. I've always enjoyed Barbara Kingsolver's books, but when I tried reading "Flight Behaviour", it just fell flat for me. Nothing in the story was changing or evolving, and it became so boring I just put it down and read something else. I usually read all books to the bitter end too, just hoping it's going to get better. I'm going to make note of this book you've mentioned as I always enjoy good old fashioned reads :) This summer I read "The Woman in White" by Wilkie Collins, and enjoyed it so much! Great old timey mystery. I remember studying Silas Marner at school... long long time ago. I got fed up of picking it to pieces at the time, but would probably enjoy it now. I wish I'd kept my old copy. The yarn is beautiful. I'm sure that sepcial little man will feel extra special indeed. I've never read George Eliot... Might have to out it on my holiday reading list!